This copy of the Canzoniere begins with a stylized portrait of Petrarch at his writing table. 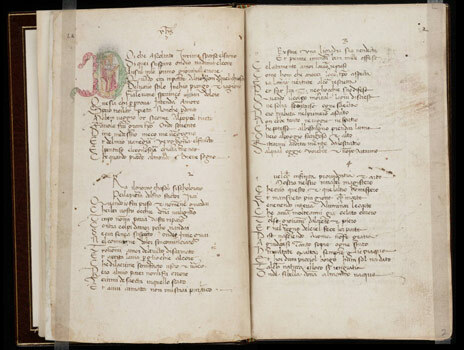 The manuscript is written in minuscola cancelleresca, a script similar to one that Petrarch adopted in early rough drafts of his poetry, some of which survive in the Vatican Library’s Codex Vaticanus latinus 3196. The minuscola cancelleresca was in wide use during the 14th century, and it has been suggested therefore that this manuscript may have been copied in the 1390s. Whether written in the 14th or early-15th century, Marston MS 99 is one of the earliest copies of the Canzoniere. It appears together with Petrarch's Triumphi, and a collection of Italian poetry by various authors. Petrarch remains the dominate figure in the manuscript, just as he was in the literary circles of both the 14th and 15th centuries.